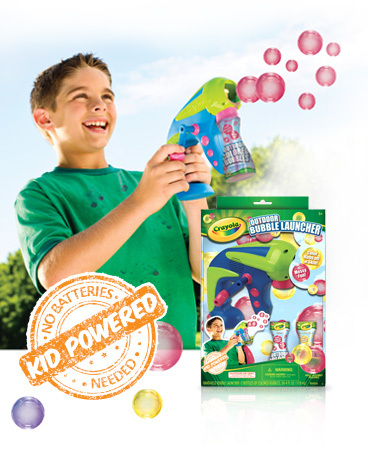 Summer is fast approaching and one of our favorite parts of summer is playing with bubbles. 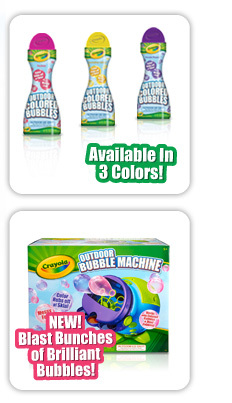 Crayola has taken traditional bubble play a step further with the introduction of Crayola Outdoor Colored Bubbles! Availible in three bright colors, these bubbles aren't like ordinary bubbles. Washable from skin, as well as most clothing and outdoor surfaces, these are messy outdoor bubbles, and should be used while wearing play clothes and definitely while outside. Anyone who knows my family knows that we are okay with getting messy while outside. I received several containers of bubbles as well as a Bubble Launcher. The launcher came with an added bonus: it is completely kid-powered, so no batteries are needed! The kids were so excited so we headed up to the park with several friends. There was a lot of interest in the Bubble Launcher! All the colors were tried out. As far as the messy aspect... Yes there's a mess. A pretty big one. There were spills and sprays from the Bubble Launcher. Bubbles popping on clothing also left streaks and stains. Definitely follow the instructions and play with these outside in play clothes! Everything washed out, although the darker colored bubbles (the pink and purple) were harder to treat. If the material was thicker, like the polo shirt in this photo, it was also harder to get out the stains. As part of my review I am able to giveaway one Crayola Outdoor Bubbles Prize Pack! Since my fancy giveaway insert is not working properly, we are going to do this the out fashioned way. Leave a comment after each of the following steps, letting me know you've completed them. I will pick a winner on Wednesday April 11. Winner will have 48 hours to supply me with their address before a new winner is chosen. 1. Leave a comment telling me who you would like Crayola Outdoor Colored Bubbles for. 2. Follow my Blog using any or all of the following tools on the right sidebar. Be sure to leave a separated comment for each following. 3. Follow Crayola on Facebook using this link. 4. Visit the Crayola Website and tell me what other item you want to try out this summer. 5. Follow Modest Mama on Facebook. Good Luck to all my readers! These bubbles sound like a great idea. I love that the bubble blower is kid-powered. I think they would make tons of fun for my Wesley. He would have a ball. #2. following your blog on Facebook. #4. Nathaniel would like to try the Glow Dome. He thinks that looks cool. #5. I follow your blog on FB. My 7 year old who likes all things messy would surely have fun with this. I'm GFC and linky following you. I would like these for my children ages 3 -14. Fun! I would like these for my kids! My daughter would like the fab snaps. I follow Crayola on facebook. I would also like to try the 3D Color Explosion! I follow you blog through emails.